What might you … and the scientific community … think was the most interesting DNA in the world? That was the question posed first to a panel tasked with deciding which entrants in the plant and animal category would reach the finalist stage to receive funding for complete genomic sequencing for 2017, and then to public voters to decide which of five finalists would take top honors. And that kind of science ain’t cheap. Most researchers budget at least $5,000 for that sequencing — and hope for grants to allow the research to proceed. Making it available for interesting projects is the goal of the Plant and Animal SMRT Grant Program, co-sponsored by — among others — Computomics and the Arizona Genomics Institute — where researchers submit their proposals, five finalists are selected by a committee of scientists, and community voting then decides the winner. And in 2016, the winner was a metal-devouring plant — a particular variety of an herb found in China that extracts cadmium, zinc, and lead from soils and so can clean up polluted soil.4 It beat out fireflies, earthworms, alpacas and a spiny mouse for funding. And I’m not so sure I could have found myself voting for a sea slug or a beetle either. Clearly, I suspect, it was the story behind one of the submissions that took it over the top. 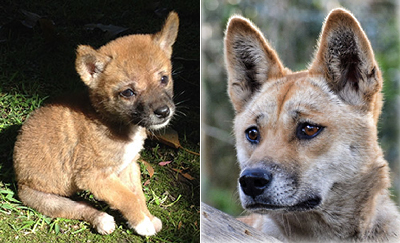 It seems that three wild dingo pups were abandoned in the Australian desert in 2014. When found near the Strzelecki Track in central Australia, the tiny three-week-old pups were dehydrated, emaciated, covered with parasites — in short, close to death. The couple who found them got them veterinary help, nursed them back to health, and raised them. Named Sandy, Eggie and Didi, the now-adult animals are purebred desert dingoes, a rarity these days where there’s so much interbreeding between dingoes and dogs. It’s the DNA of one of those dingoes, the female Sandy, that’s proposed to be tested. And, given both the sweet story of the rescue of the pups and the fact that they’re just plain cute,12 it’s Sandy for the win. Whoever said DNA — or science — was boring? Thanks for the interesting article! To me, the dingo was by far the most boring choice out of this group. It’s sad that “oh, it’s cute, let’s pick that one” wins out over things that are far more scientifically interesting. Hopefully all the others will get to proceed as well within the next few years. Of course, it’s hard to believe a mere $5,000 could stop any of these projects from happening; but if so, I’d bet asking for funding on a site similar to kickstarter or gofundme would generate more than that easily. In the past, projects that didn’t win (and some that have!) have posted their needs on Experiment.com. That looks to be the scientific equivalent of GoFundMe. Being the biggest animal lover on the planet, and a DNA buff as well, I find this fascinating, and altogether supremely cute. 🙂 Thanks for sharing this. Almost the same problem here in the U.S. with our grey wolf, which is the only pure North American wolf. Red wolves and Eastern Wolves are all hybrids (mixed with dogs or coyotes). Of our grey wolf packs, think I read somewhere the other day that Wisconsin had the only pure bred grey American wolves left. Rest had strains of coyote or our good ol doggie that lays on our couch at home. Similar problem for the Scottish Wildcat, which will interbreed all too happily with household tabbies and working barn cats. The snake will probably be studied with funding from health organisations because snake toxins have had interesting medical properties previously. My choice would have been the slug, but never mind. And the dingo would not even have been my first choice for an Australian introduced animal. The red-back spider has been introduced relatively recently and apparently its closest living relatives are in the Philippines. But we still don’t know if it arrived after 1770 or before. It certainly followed the paths made by Europeans into the hinterland. The dingo arrived before Europeans, but how is not yet known. As a child, the story was that a late immigration of Aborigines brought them. Now that we have DNA evidence about early human arrivals, that appears less likely than coming with traders, but we know nothing about trade that far back. Dingos are therefore a proxy for human interaction. In their own right, as top predators (apart from man), they have a role in maintaining a balance within nature. Sure they were interlopers, but a balance was struck before Europeans arrived. They help keep in check feral animals brought by Europeans, and that seems to help smaller native animals to survive. But it is hard to know which dogs are pure and accustomed to this role, and which are mixed with later arrivals, who are often bred with traits that may be undesirable. I did not get my choice, but I can live with the decision. The winner may be species balance over much of the inland.